Samsung Series 9 2012 Review: Who Said Samsung Can't Do Cool? 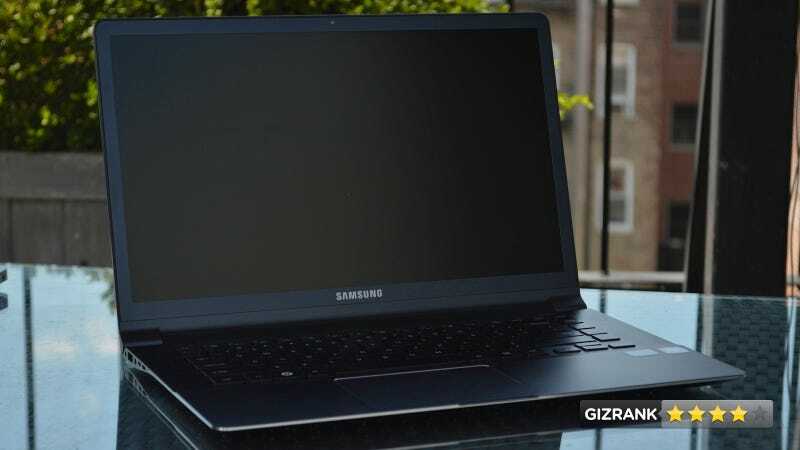 The Samsung Series 9 was one of the best Windows ultraportable laptops last year. Even though it didn't quite keep up on specs or benchmarks with some of the top-end machines, it was the most usable of the bunch. This year, as ultrabooks have made massive improvements over the past generation, the Series 9 remains one of the best. But it's still not perfect. One of the top MacBook Air competitors, and a reminder that beautiful, well-built machines aren't exclusive to Apple. Windows users who care about design as much as performance. The trackpad. Scrolling, clicking, zooming—it smoothly does what it's supposed to do. That's rare on a Windows machine, and especially on an ultrabook. The keyboard. The keys don't feel as cheap as last year's, but they also don't have a very deep throw and travel—a strength of last year's model—which makes keystrokes feel unsure. Typing on it feels like using last year's Zenbook or a Vaio Z—and that's not a good thing. For whatever reason, the brushed metal finish is waaaaay more smudgable than a MacBook's, or even Lenovo's or Dell's. The 1600x900 display is impressively bright—moreso than the MacBook Air and its 1440x900 display. And it's matte! (Swoon.) But like most Windows 7 displays, the color palette is washed-out compared to OS X. As a whole, the screen is pretty great, with a lot more real estate that you're used to on a laptop this portable. The standard 128GB SSD is unusually cramped, with upwards of 30GB worth of recovery and hibernation partitions out of the box. The Series 9 never felt hot to the touch, and no heat escaped through the keyboard, which is how some ultrabooks have been (uncomfortably) dispersing heat to avoid MacBookian temperatures. And build quality-wise, the Series 9 is shockingly solid. Everyone who touches the thing comments about how light and sturdy it feels. Graphics performance (Diablo III) was on par with other Ivy Bridge ultrabooks, with no slowdown after prolonged use. The keyboard backlight is so dim that it takes a while to even realize the keyboard is backlit. Samsung insists on loading stock junk onto this beautiful machine—"Software Launcher," is the most half-assed, bootleg version of the OS X dock you could imagine. Yes. The Series 9 is $1400, which places it right in the middle of MacBook Air and other premium ultrabook pricing, and performance and design are solid enough to make it a strong alternative to the MBA. And that was a serious question about why all your stuff doesn't look like this, Samsung. This machine is beautiful. It does nearly everything right, and improves on some of Apple's features. All things equal, the MBA and probably the new Asus Zenbook still edge ahead, but for Windows users, this is a damn good fallback. • Dimensions: 14.0" x 9.3" x .58"